By Jeffrey Burton, a Palomino Book, 2015. Illustrations. 192pp. Paperbound. £15.00 includes P&P. Available from Mrs Shirley Burton, 14 Bank Gardens, Ryde, Isle of Wight PO33 2SY. A review of Rube Burrow, King of Outlaws, And His Band of Train Robbers: An Accurate And Faithful History of Their Exploits And Adventures by George W. Agee appeared in the Spring 2015 issue of The Tally Sheet and this recent posthumous publication is by the late Jeff Burton who looked at a year in the life of Burrow, December 1886 – December 1887. 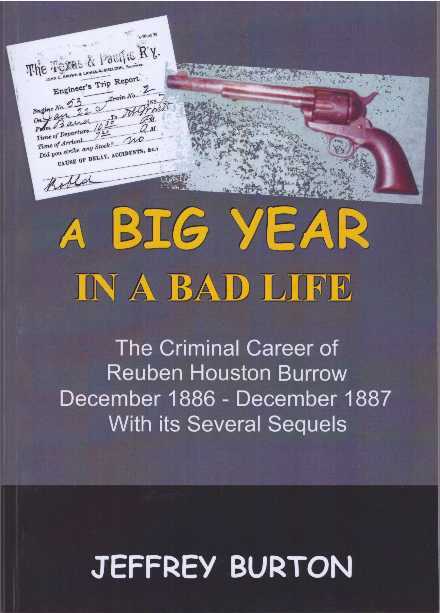 This volume begins with a few pages on the early life of Reuben Houston Burrow, followed by the details of some train robberies in which there were a number of arrests, mostly of men who were quite innocent of the crimes; events similarly repeated in many other robberies throughout the West. Halfway through, the book reintroduces Rube Burrow, his brother, Jim, and William L. Brock who in fact were the train robbers the law so wanted to lay their hands on. More innocents however were arrested as the trio were pursued. As 1887 came to a close Brock was arrested, having lost or thrown away his ‘waterproof’ and this was traced by law officers. Once arrested, he named the two Burrows as his accomplices in a train robbery in early December 1887 and thus gave the authorities the identities of some of the true perpetrators of other robberies. At the same time others who had been involved in some of the train robberies had also been arrested and brought to trial. In late January Rube and Jim were surprised by law officers in Montgomery, Alabama but while Jim was captured Rube escaped. Jim, while in custody, fell seriously ill and died in early October 1888. Rube continuing his criminal activities, was captured in early October 1890, attempted to escape but was killed. This volume, as with all Jeff Burton has written, is full of notes and insights from Jeff’s analytical mind, questioning some of the ‘history’ given to us by George Agee. In Jeff, the Society has lost a writer of a very high level and this book is highly recommended for anybody interested in Rube Burrow, Western outlaws or how a piece of Western literature should be put together.